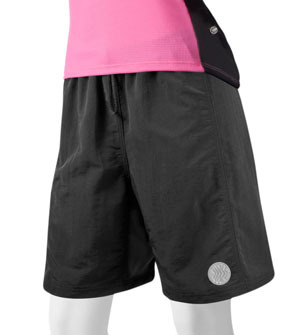 This is a padded cycling short with a drawstring waist. It is two shorts in one. It has an outer nylon shell and a stretch bike short inside. Baggy design not as flattering but the shorts are comfortable while I work on getting my weight down. Baggy is the correct word to describe. I felt like I was in clown outfit in these- returned. I think a size down would have been okay but I preferred the ATD gel touring with pockets. Pockets were main reason for considering the MB Short anyway. These are great biking shorts if you are looking for looseness and comfort! I am a solid 20W and whereas the 3x were a good fit, I opted for the 4x just because of the wide elastic waistband being more comfortable a size up. There is a drawstring but it's not needed with the wide elastic waistband. These shorts are definitely baggy but very comfortable for riding! I would love these shorts in some brighter colors! Bought my second pair of these so that I can almost always have these to wear rather than my old spandex ones. Love these baggy shorts; they are very comfy. I like the fact that they don't roll down below my stomach fat; they are always where they should be and feel good. The only thing I don't really like is the chamois pad. It feels weird; doesn't stay centered when walking or something, and is a bit light on padding when riding long distances. But, don't know how much worse than any others I have; when going a distance, the seatbones feel it in any. I'll possibly get one more pair, depending on how often I really manage to ride this summer. Love the bike shorts. I bought my size and they fit perfect. Great quality. I just wish that I had front pockets. I wasn't used to the padding... it felt bulky at first, but once on my bike it worked perfectly. 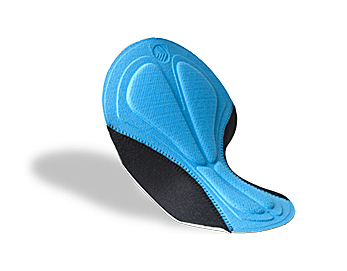 It enabled me to ride for longer stretches with much more comfort. Great, comfortable short for those folks who prefer more freedom of movement. Love these! Easy to wear, comfortable. The chamois is nicely padded for extra biking ease. The inside short does not ride up. Hugs the leg for a perfect fit. These are almost perfect . If they only had side pockets. There is no place to put a Kleenex, some spare change. I'm a pocket user and that was almost a deal breaker for me. But they are so dang comfy otherwise. When they say baggy, they mean baggy! I recently bought my usual size (L), but had to exchange the shorts last week for a M, because the large size just fell off of me! I have not received the exchanged shorts yet, but I am confident that they will meet my expectations of comfort and quality. Have not actually had the chance to use them but I know they are going to work just fine. Tried both pair on and they feel great. Love the material and the quality is definitely great. Company is a great company to purchase from - had no problems whatsoever and they are very nice. At last someone has realised that bigger people enjoy cycling too. These shorts are really comfortable and I don't feel self conscious about the lycra look. love the shorts, in Australia we don't get sporting clothing for larger women easily. 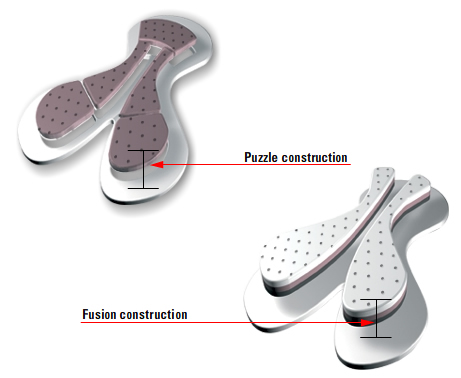 I found the sizing very generous and when I purchase my next pair they will be a smaller size. only problem I found was there is only the one pocket and it either needs to be bigger or have more pockets. The inner bike shorts are well padded and comfortable. The outer shorts add just enough coverage making a modest statement when off the cycle. Shorts fit as expected, comfortable and well made. Would buy them again. Didn't realize the difference padding would make on my seat. Very comfortable. These fit true to size. Very comfortable and great for someone who doesn't like the skin tight look. The inner shorts are thin and smooth with terrific padding - thick but not diaper-like. :). The exterior shorts are a little baggy and light weight. I wish the padding absorbed sweat a little better, but that's a usual problem with bike shorts. And these weren't that bad. I'd buy again. I have ordered this item twice previously. I ordered the same size as previous orders and thus time the sizing was way off. I called customer service and Jessie was not very sympathetic and just said, I can't find your previous orders and seemed to not believe me. I would not contemplate it may have been a defect or something else wrong. He offered to reorder for me in adifferent size and refund my shipping. These are good women's bike shorts, comfortable and roomy - too roomy for my liking. I tried on two brand name bike shorts at REI in XL. No dice - too tight in the waist for my size 16 body. So, when I went to the internet to try to find a bigger size I thought these shorts would be just right in XXL. I probably could have worn the XL. They were plenty flexible and comfortable on our 10-mile ride, but I prefer for my bottoms not to hang off me - I like a more sleek fit even at size 16. Returned the first pair for a Medium, which is baggy in the front. Fits well in the back--not bunched up at the waist. The zippered pocket lies flat and is easily large enough for credit/ID card, some cash, and a key. Comfortable fit when riding. Liner seems to have less compression than regular bike shorts. I'm more comfortable stopping off to do an errand or grab a bite when wearing these than road-bike shorts. 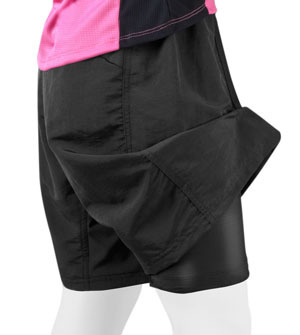 These shorts fit great and are very comfortable....perfect shorts for the 'casual' bike rider. The shorts arrived quickly but seem to run a little small. The waist us a bit short and tends to ride down. I like the overall styling but will try another size. I have 2 pair of these shorts. 1st, I ordered a blue pair, 3x. Your web site shows a different sizing chart than the shorts actually have. Also, the drawstring broke in two the 1st time I wore them. The 2nd pair I got were a 2x black pair. They have been perfect, and I will order more in the future. Received my bike shorts quickly, good quality & very comfortable! Looked at many other sites & these were priced the best, also no shipping costs which is a big plus! Will definitely be ordering other bike apparel. Much to large and baggy for my liking. I can't really comment on the quality because I had to send my first pair back. The padding didn't hit me on the right spot, I may have ordered them too large. I reordered a different pair but haven't received them yet. As a big gurl it is always hard to find workout clothes, especially for spinning that fit and are comfortable and that you are not thinking about, tugging at or at war with while you are trying to exercise! Many thanks for the great shorts! I will definitely be back to order other items!!! !